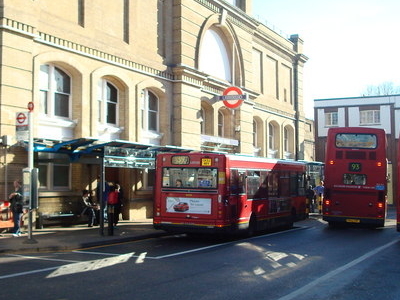 Putney Bridge is a London Underground station on the Wimbledon branch of the District line. It is between Parsons Green and East Putney stations and is in Zone 2. 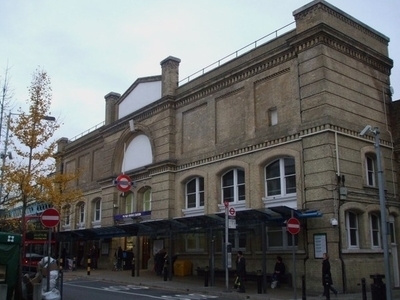 The station is located in the south of Fulham, adjacent to Fulham High Street and New Kings Road (A308) and is a short distance from the north end of Putney Bridge from which it takes its name. In addition to the Hurlingham club and Hurlingham Park, Fulham Palace, the former home of the Bishops of London is nearby. It now contains a small museum set in Bishop's Park. Fulham Football Club's Craven Cottage stadium is about 1 kilometre to the north-west, and the tube station is often very busy on matchdays. Putney Bridge has a bay platform (platform 2) which could only accommodate C stock trains and is located between the current eastbound and westbound tracks. After the C stock was removed from service in June 2014, the bay platform has ceased to be used. As the westbound track is on a curve, there is a 10 mph speed limit for westbound trains. 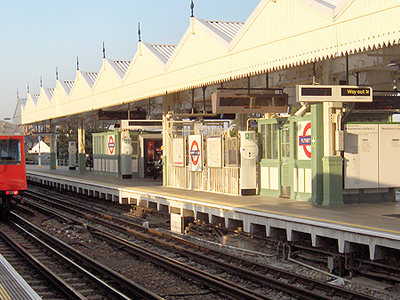 The resignalling plans for the District line involve converting the current bay platform into the new westbound platform and abandoning the current westbound platform. This would allow the speed restriction to be eliminated. Here's the our members favorite photos of "Metro Stations near Hammersmith and Fulham". Upload your photo of Putney Bridge Tube Station!